Finland is situated at the same latitude as Alaska with arctic climate in the winter. However the finnish summers are as warm as in central Europe, so the difference in temperature between summer and winter is big. Although the Finns should to be used to frozen lakes and sea, over a hundred people drown every year due to going through thin ice. This is in particular a problem among sport fishermen and people driving their snowmobiles on weak ice. Airboats or "hydrokopters" as they are called here have been used in the Nordic countries ever since they were invented (in Canada in the 1930s). A great number of of people living on islands around the finnish and swedish coast are dependent on some mode of transportation that can cross both thin ice and open water. 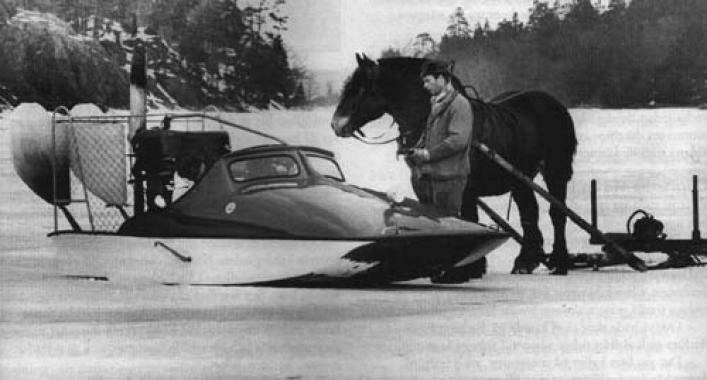 Hovercraft have vulnerable skirts that tend to get torn by the ice. This is why airboats are common in the Nordic countries. Even with the popularity of airboats, there has been rather limited production of airboats in the area. 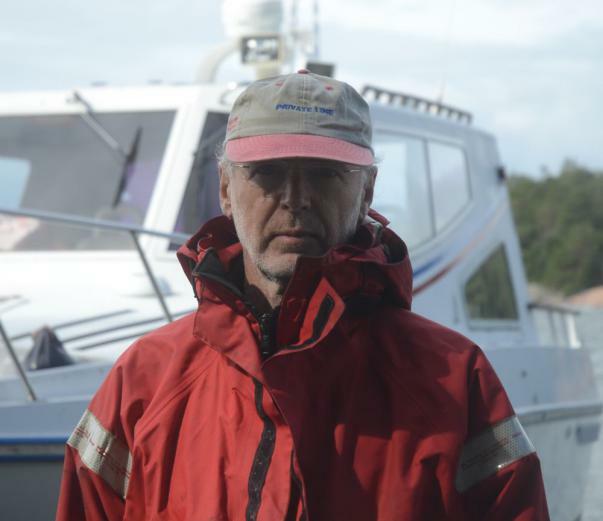 In 2005 Henrik Paersch started developing an airboat using american airboats as a model. This type of airboat was, however, not a good solution for the Arctic conditions as the flat bottom picked up every little bump on the ice and was hard on the structures and passengers. So with the collaboration of some engineering students, he instead constructed an airboat with air suspended pontoons. Later it became apparent that Polyethylene (HMWPE Polymer) was a more suitable material than aluminium thanks to its flexibility. 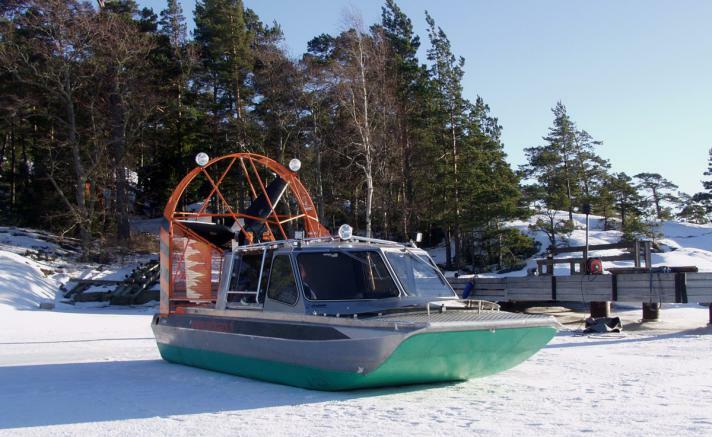 Now all the airboat models do have a PE hull that is both flexible, tough and has a very small friction on ice and snow. FROM THE EXPERIENCES FROM BUILDING AIRBOATS IN POLYETHYLENE CAME THE IDEA OF MAKING BOATS IN THE SAME MANNER. If the material can take the tremendous G-forces of the ice, it must be able to withstand the beating of waves. As it turned out, HMWPE is a fantastic material for boatbuilding . The boats can hit rocks literally without any damage, they are environment friendly, recyclable, and easy to repair. Henrik Paersch has a Master of Arts degree from UIAH, nowadays called Aalto University. Angel Trading has since 1999 been selling boat lifts in Finland. Meanwhile Henrik has studied 3D-Cad design, using Solidworks and Rhinoceros. In Finland the lakes freeze in November - December and the Baltic Sea starts getting solid in January. This poses several challenges for people living in this Nordic country. Not only do thousands of people live on islands, but almost every family has a summer house by a lake or at sea. Ice fishing a popular hobby and almost everybody move on the ice at some time. The idea behind Angel Trading and Design is to help clients overcome at least some of the challenges which the Arctic climate poses. This means boat lifts to protect property, Ice going boats and Airboats to safely get from point A to B, and in order to save lives in difficult conditions. Our first priority is to design the safest boats on the water. In addition to safety, the professional user demands practical solutions and above all, good handling. The boat must track well and predictably through sharp turns and ride smoothly in high seas. To achieve these goals we have chosen a construction material that is strong, durable and even flexible to a degree. The hull lends it's stability from a fast RIB boat often used by rescue organisations. The small trim angle on plane gives a long waterline at the keel, giving a smooth ride in a chop. The chine just at the right height, immersed at the rear, gives the boat stability at high speeds. While the RIB boat has round pontoons that take a lot of the available space, the Panther boats have pontoons that form only half a circle. The vertical side boards allow for much more interior space in the boat. There is a lot of discussion about the pros and cons of "lifting strakes". Above the water line spray strips divert the "whisker spray" and can decrease drag by a few percent. But submerged strips give more wet area and thus increased drag and do not give lift, contrary to what most people believe. Strakes, steps and other appendages make the behaviour of the boat unpredictable and some times even dangerous. Strakes also produce a lot of noise and slamming. Bulkheads increase the structural rigidity of a boat and they must be attached to the deck which is an important part of the hull giving it stifness. The Panther hull has a honeycomb like structure which makes it extremely strong. Only the longitudal bulkheads are connected to the bottom sheet which permits the bottom sheet to flex slightly and thus mitigate shocks from the waves. This can only be achieved with a material like polyethylene. Listen to the boat at high speed. You cannot hear any banging from the waves and even engine noise is attenuated. A safe boat is unsinkable. The pontoons and most hull cavities are filled with flotation bags. This means that a water filled, fully loaded hull will sink only about 20 cm and will be extremely stable as the flotation is located at the sides. HMWPE boats are welded from precut sheets that fit together like a puzzle. No molds are needed, which make customizing for different client types an easy task. Making repairs is possible on site. You only need a hand held extrusion welding machine and some welding wire. In Florida most airboats have aluminum hulls with polyethylene polymer sheets covering the bottom and sides. The polymer is there to minimize friction and protect the aluminum sheets. But having bottom sheets doubled this way increases weight considerably. As a consequence, we decided to construct the whole airboat hull of just polyethylene, achieving a much lighter construction. Also another advantage comes from the flexible PE material; driving on ice can produce tremendous G-forces and point loads on the bottom. This is why airboats for icy conditions cannot be built from GRP (glassfibre plastics). But PE as a shock mitigating material is perfect for the application. Polyethylene is probably the polymer you see most in daily life. Polyethylene is the most popular plastic in the world. This is the polymer that makes grocery bags, shampoo bottles, children's toys, and even bullet proof vests. For such a versatile material, it has a very simple structure, the simplest of all commercial polymers. A molecule of polyethylene is nothing more than a long chain of carbon atoms, with two hydrogen atoms attached to each carbon atom. Excellent for many food related products, FDA, NSF, and USDA approved for direct contact (depending on grade of material). This material machines extremely well. Other uses include pipe fittings, wear plates, hinges and cutting boards. Good impact resistance, light weight, very low moisture absorption, and high tensile strength. Not a good candidate for gluing. Mechanical fastening is one option, but preferably joined by hot air or nitrogen welding. Also, Ultrasonic, Laser, and infrared welding.